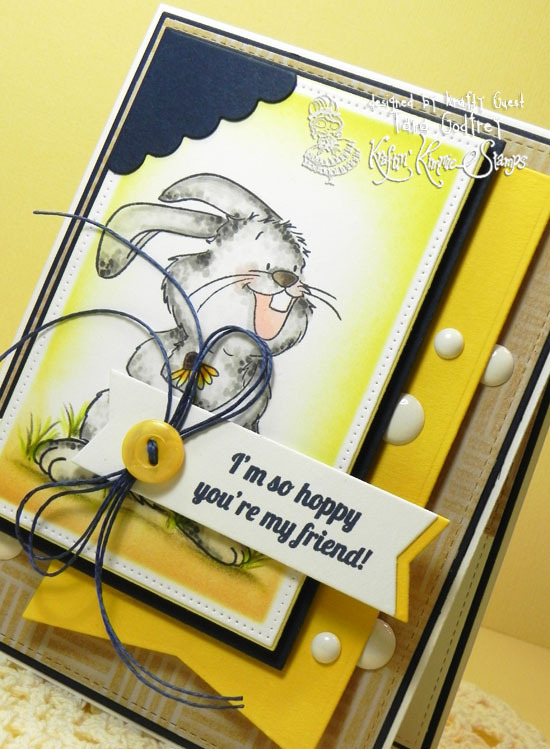 Welcome to Day FIVE of the March Release at Kraftin' Kimmie Stamps! We have another AMAZING day! Today is the final day of peeks and the release party is this morning at 11am EST! We've got a second set from Artist Cheryl Grant! 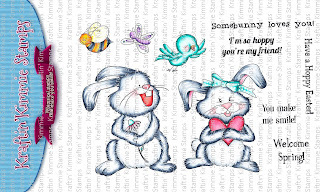 It's called HOPPY FRIENDS!! I hope you can join us for all the fun and excitement and prizes this morning beginning at 11AM EST!! You can come hang out with the me and Krafty Team at our LIVE ONLINE RELEASE PARTY! 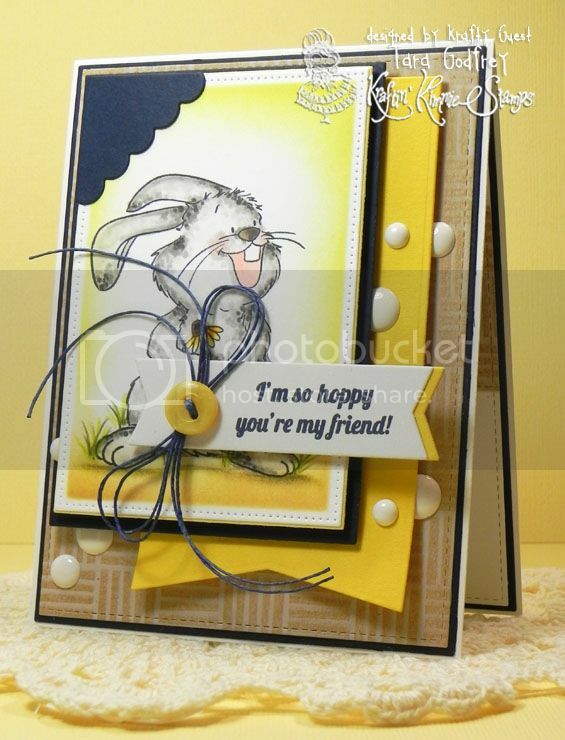 I coloured up the sweet bunny from the Hoppy Friends Stamp set with my Copics cut the image out with my Pierced Rectangle STAX Die-namics and then left the image in the die and inked with Squeezed Lemon, Scattered Straw and Tea Dye Distress ink. I stamped my fave sentiment from the Hoppy Friends Stamp set in Nightshift Blue Premium Dye Ink and added a Lemon Drop button tied with Navy Hemp twine. 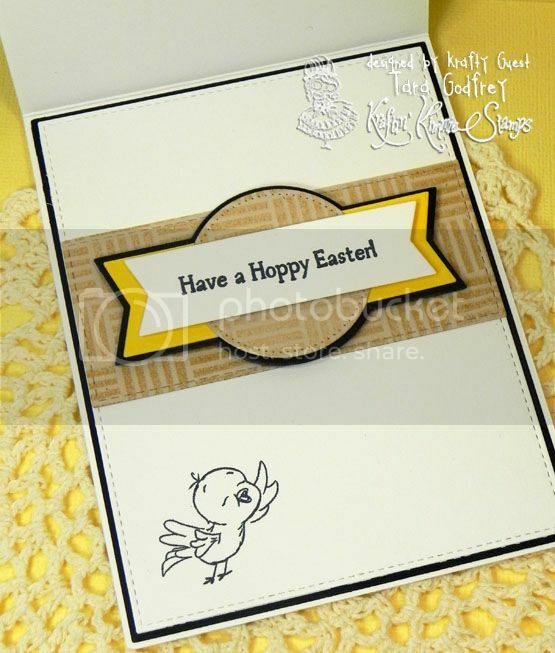 I finished off the inside of the card...I adore the little bird in the set and stamped a shadow image of him and another sweet sentiment from the Hoppy Friends Stamp set.